For many people, second only to wedding rings, there is one thing which automatically springs to mind on a wedding day. The wedding cake. Often in three tiers, the traditional cake has icing, marzipan, and dried fruit. Topped with an iced statuette of the happy couple. The wedding cake doesn’t have to fall into this convention. Instead of fruit and marzipan, there is nothing to stop you going for a chocolate or Victoria sandwich sponge. Why not defy convention and go for a savoury one? Or a selection of homebaked treats? Here’s a few to spark your imagination. A wedding cake. Of cheese. Image by Ed Clark (via Shutterstock). 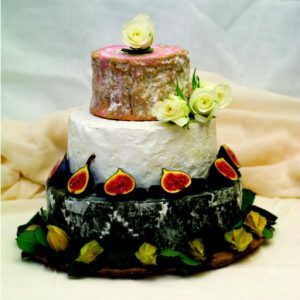 Not a cheesecake for your wedding but a cheese cake in the literal sense. Instead of a triple tiered sponge cake, imagine a cake with Blue Stilton at the bottom, followed by a smaller tier of Double Gloucester. Then smaller tiers with Cheshire and Wensleydale cheeses, topped by a small tier of Mature Cheddar. If you are partial to the finest pork, the wedding pie has become a popular option. It isn’t only offered by butchers; Marks and Spencer offer them as Tiered Celebration Pork Pies. Specialist butchers are a better bet for your porcine related wedding cakery. Not a good option if you have vegetarian or vegan wedding guests, though a change from the norm. They have also become a popular wedding cake alternative on caterers’ menus. What’s more, you can also get a pork pie wedding cake with cheese. What is there not to like? Eden Manor Bridal, 28 July 2017.